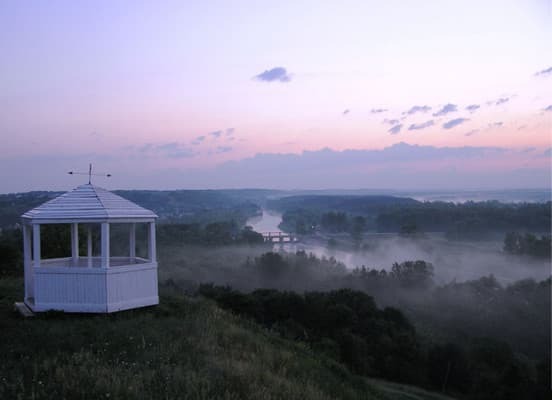 Sanatorium "Psely" is located in one of the most picturesque and ecologically clean places in Ukraine - the village of Velikaya Bagachka. There is a sanatorium on the bank of the winding, fast-flowing Psel River, in whose water the opposite shore, drowning in the green of a birch grove and oak grove, is displayed. Own sandy beach. The direction of the sanatorium is sanatorium-and-spa treatment, medical rehabilitation and health improvement of the population. The main asset is the chloride-sodium slightly alkaline mineral water "Velikobagachanskaya", which is obtained from wells with a depth of 300 m. Wells are located in the complex. Sanatorium "Psel" has three buildings: a 2-storey main building and two 1-storey buildings with rooms for improved planning. For family rest three separate cottages on the river bank are offered. 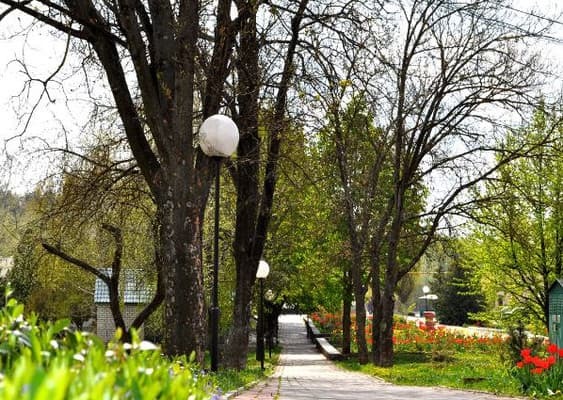 On the territory of the sanatorium there is a bar-restaurant and a canteen for 200 people, where the guests will be offered a wide range of dishes of national Ukrainian cuisine, vegetarian food, a diet menu. Guests of the sanatorium Pesol can use the following services: guarded parking lot, telecommunication services (telephone, fax, e-mail, mail), access to Wi-Fi Internet, rent of barbecue, skewers, fishing rods, sports equipment, sauna, massage room, underwater shower-massage, seasonal hunting, fishing, archery, horseback riding, beauty parlor, excursion programs, cultural events, tennis court, badminton, board games, picking up mushrooms, berries, medicinal herbs, for young guests - a games room, children site. 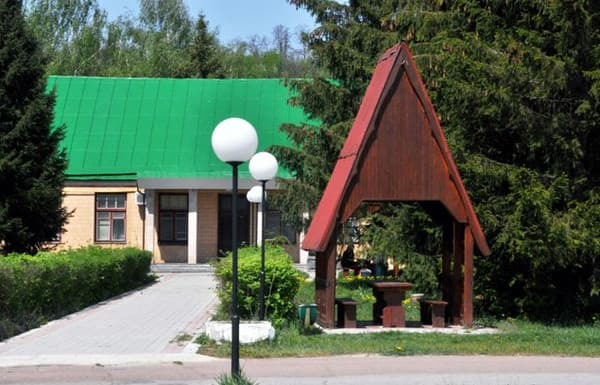 Distance to Myrhorod - 28.8 km, to the railway station of Mirgorod - 25 km, to the bus station. The Great Bagachka is 1.3 km away. 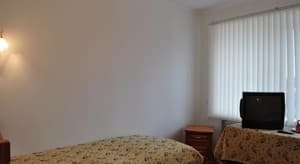 Description of the room: Bright small room with twin beds, bedside table, wardrobe, TV. Shared shower and toilet for 2 rooms. An iron and ironing board are provided upon request. Description of the room: Cozy 3-room 3-bed room equipped with beds, bedside tables, desk, wardrobe. In the room: satellite TV, air conditioning, refrigerator, cold / hot water. An iron and ironing board are provided upon request. 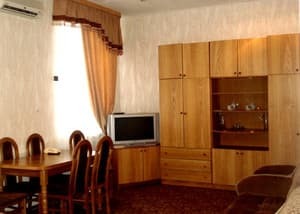 Description of the room: Double room is equipped with two beds, bedside tables, table, wardrobe, as well as satellite TV and internet. Shared shower and toilet for 2 rooms. An iron and ironing board are provided upon request. 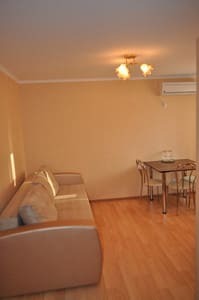 Description of the room: The cozy single room is equipped with a bed, a bedside table, a table, a wardrobe. In the room: satellite TV, telephone, cold / hot water. An iron and ironing board are provided upon request. 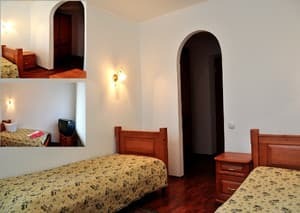 Description of the room: The cozy double room is equipped with a bed, a bedside table, a table, a wardrobe. In the room: satellite TV, telephone, cold / hot water. An iron and ironing board are provided upon request. 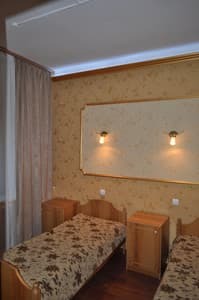 Description of the room: One room is equipped with twin beds, bedside tables, table, wardrobe. In the room: satellite TV, air conditioning, cold / hot water. An iron and ironing board are provided upon request. 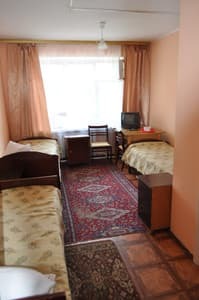 With a SINGLE settlement, the price of the room is 335 UAH. Description of the room: Two-room double room equipped with twin beds, bedside tables, table, wardrobe. In the room: satellite TV, air conditioning, telephone, cold / hot water. An iron and ironing board are provided upon request. Description of the room: Two-room suite is equipped with a bed, a bedside table, a desk, a wardrobe. In the room: satellite TV, air conditioning, refrigerator, cold / hot water. An iron and ironing board are provided upon request. 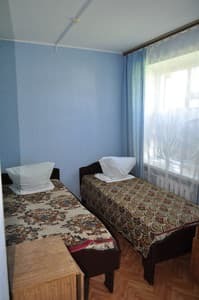 Description of the room: Separately standing two-room cottages with equipped kitchen (built-in electric stove, extractor, electric kettle, dishes). Are located on the guarded beach of the sanatorium. In the room: double bed, sofa, working table, wardrobe, plasma TV, cold / hot water. We place children of any age with additional places. Children under 4 years old pay 30% of the price of the tour, from 4 to 7 years - 50%, from 7 years - 100%. On the territory of the sanatorium there is a bar-restaurant and a canteen for 200 people. 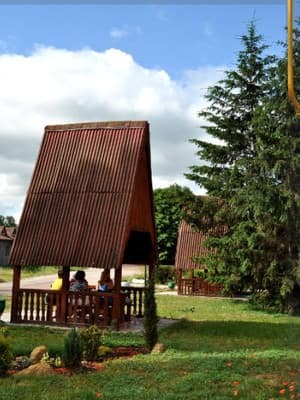 Sanatorium "Psely" is located in one of the most charming and ecologically clean places in Ukraine - the village of Velikaya Bagachka. There is a sanatorium on the picturesque bank of the winding, fast-flowing Psyol river, in which the opposite shore is drowning in the greenery of a birch grove and oak grove (a variety of coniferous, mixed and deciduous forests). 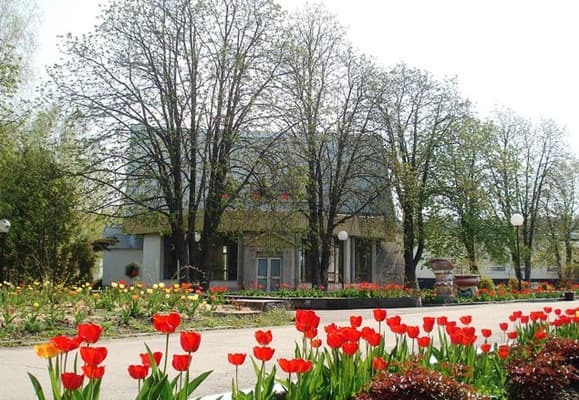 Distance to Myrhorod - 28.8 km, to the railway station of Mirgorod - 25 km, to the bus station. The Great Bagachka is 1.3 km away. In the sanatorium "Psel" a comprehensive medical examination is conducted, after which the doctor prescribes treatment and health procedures. Specialization of the sanatorium is the treatment of diseases of the digestive system, endocrine diseases, urology, respiratory system, musculoskeletal system. The sanatorium is equipped with modern medical equipment for diagnosis and treatment of diseases of the kidneys, genitourinary system, liver, gall bladder, bile duct and pancreas, gastrointestinal tract, pulmonary system, musculoskeletal system, water salt exchange disorders, etc. The therapeutic base of the sanatorium is created on the basis of the unique water "Velikobagachanskaya", used mainly for drinking, as well as for medical procedures - inhalations, irrigation, baths, etc. The sanatorium employs 11 doctors of various profiles, the highest and the first qualification category, honored doctors of Ukraine, candidate of medical sciences, academician of the UAS. Stomatology. In addition, the sanatorium has a department for the medical rehabilitation of chronic diseases of the broncho-pulmonary system, bronchial asthma, a department for medical rehabilitation of chronic diseases of the musculoskeletal system and a medical diagnostic department equipped with modern equipment. Clinical and biochemical laboratories, offices of duodenal sounding and research of gastric juice, computer diagnostics of the whole organism, computer hemoscanning, computer rheovasography. Hardware physiotherapy, information-wave therapy. By train to the station "Mirgorod", then by bus to the bus station of Velikaya Bagachka. 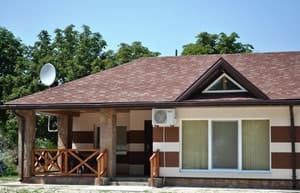 From the bus station of the village V. Bagachka to the sanatorium "Psely" - by bus or private taxi.